Here it is: the fourth interview of my journey into Storytelling. Please check out my previous Storytelling posts here. And my 365 Reviews here. I’m lucky to have met so many amazing people over the past few years, and David Park is one of those people. Chef Park is a James Beard Award semifinalist and Plate Magazine’s Chefs to Watch 2017. I was turned onto hanbun, David’s now closed restaurant in Westmont, IL., from a foodie colleague that had experienced the food court phenomenon. My wife and I booked a dinner seating for eight (7 months in advance), and at the dinner, we all hit it off. The food was fantastic, and the company, including Chef and his staff, was tremendous. I was lucky enough to venture into hanbun one last time before they closed their doors, but I stayed in contact with Chef David, and he graciously agreed to let me interview him for the blog. I will say, our conversation was much longer than this, and I wish I could post it all, but we are sticking to the storytelling theme, so the gems about his fast-food favorites will remain safe with me! What appears below is a cutting of our conversation. Chef David, as young as he is, has a ton of knowledge to impart to novice chefs and promising masters of any craft. He is an amazing cook, a cool guy, and our takeaway today is a timeless one. Enjoy! Sorry for the abrupt beginning to the interview; we were chatting, and this is where we started to get to business. Me: How does your childhood affect the storytelling of your cuisine? DP: Childhood plays pretty much every part of it. Everything starts with the flavors I grew up with. What my mom cooked, what my grandmother cooked. Things that I remember. Going to the market with my grandmother. Buying fresh produce. It was in Korea. I was born in Korea, so I have all those fond memories of that, and I try to recreate that. I try to keep the soul intact of the Korean food I grew up on, but at the same time making it my own. I remember watching my grandma making Korean chili paste or soy sauce with other grandmas in the apartment that we lived in. Things like that are cool memories that not everyone has, and I think because of that I try to cook with the soul of Korean cuisine. Me: Is it hard to replicate those dishes that you remember fondly from your childhood? Is it disheartening if you can’t get it exactly right? DP: Kind of. I try to get it as close as possible because I know I could never recreate that. Or when people complain that this is not my grandma’s food or this is not my mom’s food, I have to remind them, I am not your mom. I am not your grandma. It will never taste like that. Me: You’ve had that as a complaint? DP: That’s the biggest thing. Other Koreans coming into the restaurant and saying this is not traditional or this is not Korean food, and I’m like…according to who? But in order to grow, you have to experience new things, and the food is just my take on the history, not my being a traditional grandma. It’s just being inspired by the tradition. Me: When you create a dish do you think of story, part of that tradition? DP: Sometimes I remember a story or I remember something about a certain ingredient or a dish that I want to influence my new dish. Then I can talk about it, and it comes more from the heart. I don’t go into creating a dish each time thinking…I’m going to tell a story with this dish, but I guess every chef or anyone in any creative field wants to say something about themselves through their work. Me: So, while you may not know it, a lot of that creation, is then affecting your story moving forward, right? All of those things before they were story, become part of what you have to say? DP: Yeah, for sure. I think so. I mean, meeting all of our guests, becoming friends with a lot of our guests, and then being able to share your childhood through food definitely sparks some sort of story. And that has inspired me to push forward and become a little more Korean in our food. Me: When you create, and things are not going as well as you would like, do you lean toward scrapping the idea or tweaking until you are happy? DP: I try to tweak. I only try to come up with dishes that seem to make sense in my head. They call it a flavor bank or palatte memory where you have a certain taste that you remember, and then you combine all of these things together in your head and you’re like…these things go well together. Right? You think about the balance. I try not to give up on a dish because it took so long to come up with it. I want to try and make sure it comes together. DP: For sure. Eating becomes homework. DP: All the time. Anyone in a profession, right? If they are a baseball player, and they are watching another baseball player pitch, let’s say. They critique their movements, their rotation. When I taste something it becomes why don’t I like this? Could it be better? Does it make sense? Me: So you never just go out with your wife and enjoy a meal? Me: Is Jen the same way, or is she like…just enjoy the meal? DP: She’s becoming more like that, I think. It happens to the best of us. We don’t want it to. Me: If you were going to give advice to young chefs who are trying to take their passion and their love of food and create a life from it, seriously pursuing their quest in the kitchen…what would it be? DP: Take your time. Learn the craft. Learn the techniques. Learn the basics. Start somewhere where you learn to properly sear, properly season, chopping things. The basics matter the most, and a lot of people forget that because plating something looks so much more fun than preparing to get to the plate. Put in your time to experience these things. Don’t jump in too quickly. In order to be yourself, you need to cook the food that speaks the most to you. If there is no depth, no soul…what’s the point? Go back to your childhood. Somewhere you can speak from. 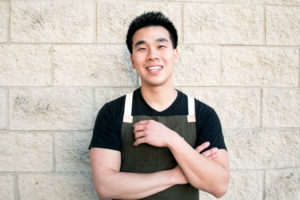 There is so much great substance here, but my takeaway from my conversation with Chef David Park is this: do your homework. If you want to be tops in a field, or be taken seriously, do the work…learn the basics. I love that. I also love finding inspiration from your childhood. Passion fuels success. If you want to check out the hanbun website, you can click here. There is no restaurant currently open, but there will be a triumphant return soon!